https://www.roadandtrack.com/new-car...v8-specs-info/ The motor uses a new cam-in-block, overhead valve architecture with cast iron block and forged steel crankshaft, as well as oil jets cooling the pistons under heavy loads. Unfortunately no specs yet. New for 2020 is also a 10-speed TorqShift automatic gearbox with a wider gear ratio span than the previous 6-speed auto. The gearbox has a compact design that fits in the same space as the 6-speed auto and is just 3.5 pounds (1.58 kilograms) heavier. It features five drive modes - normal, tow/haul, eco, slippery, and deep sand and snow. Nice to see they went back to putting the cam (single) in the block. Their OHC engines were a bi*** to work on. Maybe they can keep these spark plugs from blowing out of the heads or breaking off in the block. New cars and trucks have gotten too hard to work on yourself. At least this engine looks like it wouldn’t be too hard to change a head gasket. I would question R&T's choice of "giant": while larger than any very recent engine, 7.3 litres isn't all that large by historical standards. GM's "big block" for trucks was a 454 cubic inch V8 - not unusual for the large engines of the time when it appeared - which was 7.4 litres, and grew to 8.1 litres for its last version (ending in 2009); it is still sold as a 8.0 L "crate" engine. Chrysler's big truck engine for a while was an 8.0 litre V10, which was better known and longer-lived in its aluminum version in the Dodge Viper. When Ford's last big V8 - the "385" family's 460 cubic inch (7.4 L) - wasn't being used in enough models to be worth continuing, it was replaced with a 6.8 litre V10 variant of Ford's big engine family of the day. That was 1998. Two decades later the 6.8 is still in production - and still the only gas engine in the largest Ford chassis - and apparently it's time for something new, and more powerful. It's interesting that this article, and the others that I found with a search about the new engine, don't mention that the 10-speed transmission is expected to be a heavy-duty version of the Ford/GM 10-speed found in the F-150, Mustang, GM light trucks, Camaro, and who knows what else. Maybe they assume that everyone already knows that, since it hit the news a year and a half ago. It will be called the 10R140: the ‘10’ stands for ten forward gears/speeds, the ‘R’ stands for rear-wheel-drive application (and implies longitudinal orientation), and ‘140’ stands for 1,400 N-m (1,032 lb-ft) maximum input torque capacity. That capacity matches the current 6R140 SuperDuty transmission, and is a big step up from the current 10R80 in the F-150. Extra capacity may mean more case length (ZP's 8HP family of transmissions gets longer in the higher-capacity versions due to wider gears and bigger clutch packs), but it won't be much bigger overall than the current 6-speed. GM's version is the 10L90 found in the Camaro, and 10L80 found in GM light-duty pickups and related SUVs. At GM, the naming is similar: in 10L90, the ‘10’ stands for ten forward gears/speeds, the ‘L’ stands for longitudinal orientation, and ‘90’ stands for 900 lb-ft (1,220 N-m) maximum input torque capacity. As far as I know, GM hasn't using it in heavy pickups yet, but in a press release says the 2020 Silverado HD will have an "all-new, Allison 10-speed transmission"; this is reported to be the GM-made Ford/GM 10-speed with Allison branding (for "HD cred", I guess). Trailer: 2014 5.0TA "The HAB"
“There’s no replacement for displacement”....in fact, it might have been Jim here! Wonder how they get VCT with a single cam in the block? Probably with a DouCam by Mechadyne. This type of cam was used in the Dodge Viper. A vane-type phaser is installed on the cam sprocket to turn the camshaft relative to the sprocket, thereby adjusting the timing of both intake and exhaust valve operation. There are many valve control mechanisms; this is one of the simplest. DuoCam is interesting - thanks Eric. This controls only phase (of intake, or exhaust, or both together), not lift or duration, but even being able to vary one set of valves and not the other (thus varying overlap) is pretty good within a single cam. Chrysler apparently called it CamInCam. The GM and DuoCam systems appear to use a similar mechanism (the vane-type phaser) to adjust the camshaft phase. 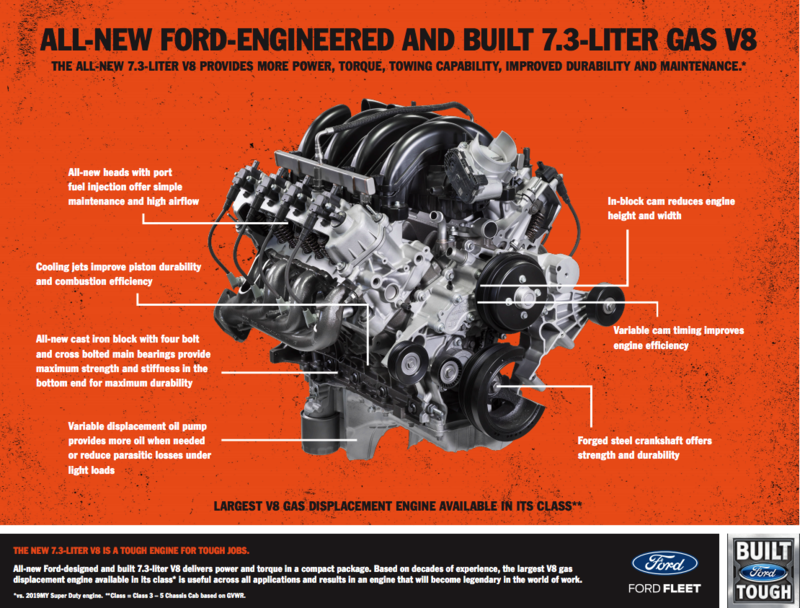 I haven't seen any indication of which system Ford is using with this new engine. Nice! didn't know anything about them. Although I've had Ducatis for about 40 years, so I'm verrrrry familiar with desmo cams. Wow...that is bigger than two eco boosts. The only Escape related need for this engine is if you were hauling 2 or 3 trailers on a flat deck for delivery.